The former Oasis musician is friends with the comedian, but in an interview with Vice.com's music site Noisey, he joked he would only join Brand's revolution if he agreed to make him the Duke of Manchester. 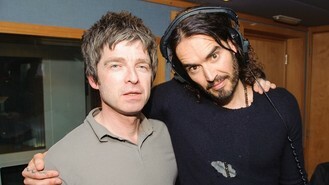 Noel said: "Well, I love Russell but he don't half talk out of his a*** sometimes. His fine, muscular, pert a***. He does talk a load of s***. "I couldn't see him overthrowing a table of drinks. Do you think he's going to put himself in charge? Hmm, I wonder." He added: "I was out with him the other night and he says it with a straight face. 'There is going to be a revolution.' And I'm like, 'F***ing hell, mate, give us a shout when you're going down The Mall with your pitchforks and that, I'll come and serenade you on my lute before we eat the Queen. "He says, 'Come on mate, back us' and I'm like, 'If you make me the Duke Of Manchester then I'm in'." The High Flying Birds frontman also confessed his despair at the current state of the music industry, where people believe they have the right to listen to music for free online, and not pay for it. Noel ranted: "It infuriates me that people are more willing to sit in a coffee shop and spend a tenner on two coffees, talking about the weather with their friends, and that coffee will last 45 minutes. "Yet, they will physically get angry at you for asking them to buy an album for a tenner that will last a lifetime and might tell you about yourself and might even change your life or how you dress or the outlook on everything. It's a strange moment we're in where people are willing to spend money on s***." Noel also shares his views on hangovers, crisps and the musical tastes of his own children in the hilarious video interview.